Returning from a relaxing few months of Florida in their bird condos to mate, lay their eggs, and prepare to fly south once again, birds can mistime their migration as they struggle to keep up with the changing climate. National Bird Feeding Month was founded by John Porter, an Illinois congressman particularly sensitive to the thousands of miles birds must commute. The intent for the month of February is to spread goodwill and a few seeds, ensuring that these harbingers of spring get enough to eat that they might chirp with delight. John Porter, a congressman from Illinois, recognizes Bird Feeding Month. They become a mainstay at the end of WWI. Table feeders are redesigned to hang from branches. Florence Bailey begins teaching the value of bird conservation in Washington, D.C. He writes of the joy neighborhood birds derive from corn kernels. Mix your birdseed with peanut butter and watch as the potent combination attracts Sparrows, Finches, Robins, Blue Jays, and more. Enrich yourself and visit your nearest National Audubon Society chapter. Founded in 1905, Audubon uses science, education, and grassroots advocacy to advance its mission of conservation. Nothing invites birds to your yard like posh, luxurious treatment. Couple your bird feeder, stocked with the highest quality of seeds, with a freshly poured birdbath to show you’re the most hospitable host on the block. The birds will enjoy their visit so much that they may even take to social media and tweet about it. The first Robin of spring signifies that nature is shedding its winter coat, shaking off the cold, and warming itself for spring. As Robins flock to backyards, so, too, do bulbs begin to peak out from the formerly barren trees and the tips of grass bravely venture from their subterranean refuge into the sun. Even though February borders springtime, it’s still cold. Seeds, leaves, and blossoming plants can be few and far between. For the early arriving birds, placing bird feeders filled with seed can mean the difference between life and death. 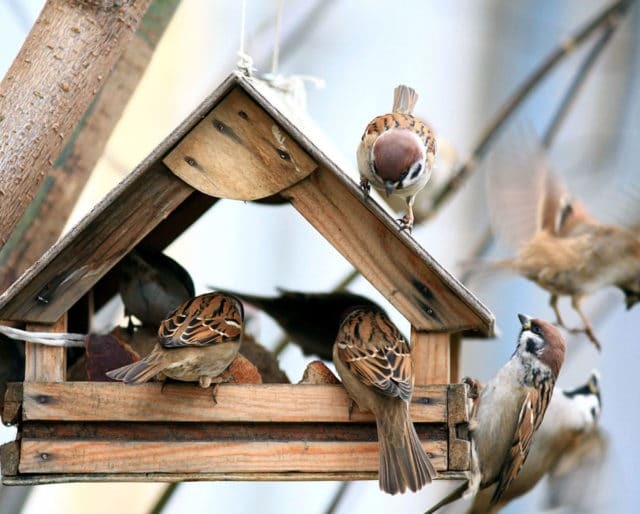 Birds are crucial for a properly functioning ecosystem and healthy garden. They pollinate plants, disperse seeds, scavenge, and recycle nutrients back into the earth. That’s worth a nibble on the flowers.